Spring Break is right around the corner. Do you know what you're doing with your kids? The good news is, there's lots of options. LAS VEGAS (KTNV) — Spring Break is right around the corner. Do you know what you're doing with your kids? The good news is, there's lots of options. 13 Action News looks at the free and affordable choices here in the valley. "We have no plans yet. We have nothing planned for Spring Break," says local mom, Erica. We get it, you're busy. "I work two jobs," says Erica. Finding time to make Spring Break plans might not be at the top of your to do list. Moms we spoke with say, while there's no set schedule, they'll be sure to keep their kids busy. "A lot of swimming. A lot of maybe arts and crafts. Just out, going to the park, riding bikes," says local mom, Torrie. The good news is, in our home town, there's always plenty to do. And we're here to help, with a rundown of what's happening. "We have amazing parks, you can go to the Strip, we have mountains, we have lakes, we have pools, amazing library system. There's always something to do," says Nannette Melamed, owner of Vegas Family Guide , an online resource for local family-friendly events. She points out, Spring Break is the start of swim season. "Some of the splash pads will be open. 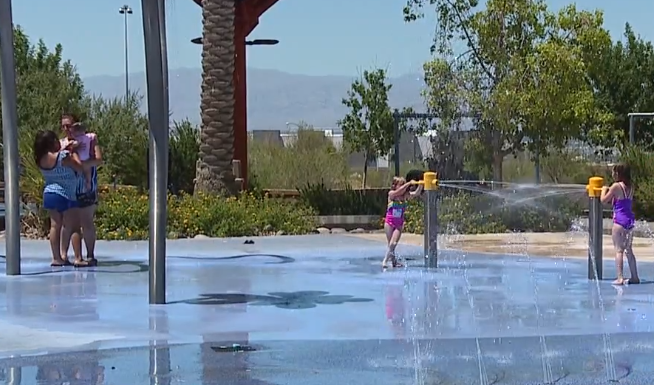 Clark county splash pads open April 1st... There's also some local casinos that you can get into their pools and most of our rec centers have indoor pools. Outdoor pools won't open until closer to Memorial Day," says Nannette. The valley's two major water parks; Wet 'N' Wild and Cowagunga Bay are also open for Spring Break. "If you're looking for more outdoor stuff to do with your family, definitely some hikes like Red Rock. We have flowers blooming down at Lake Mead, down by Willow Beach," says Nannette. There's also plenty of special events: during the first weekend of Spring Break, there's the Clark County Fair and Rodeo in Logandale with live entertainment, a carnival and plenty of food. Plus the Las Vegas Lights Football Club will take on the Seattle Sounders at Cashman Field. Soccer tickets start as low as $15. "We also have WORCs Racing, off-road racing that's coming to the New Orleans Arena... Towards the end of Spring Break in Pahrump, the Monster Truck Insanity Tour is back," says Nannette. If you're looking for something a little more low-key, try your local library. You'll find: story times, arts and crafts, cooking classes and more. "Whitney Library is actually offering a superhero Spring Break," says Nannette. They'll be hosting special superhero-themed story times, and screening some of your favorite marvel movies all for free. Remember, it doesn't cost a dime to see some of the biggest attractions on the strip like: the Bellagio fountains, the Mirage volcano and the new light show at the Las Vegas Eiffel Tower. And if you are considering tickets to a Vegas show, be sure to ask about Spring Break specials for locals. If you have to work over Spring Break, consider dropping your kids off at your local parks and rec center. Clark County, Las Vegas and Henderson are all offering spring break camps. But be sure to call and book as soon as possible, because spots can fill up. In the end, if all you have is an hour or two with the kids, then head to the park. With highs typically in the 80's, Spring Break should be beautiful. "Play on the swings, slide on the slide, kick some balls around. Just enjoy some family time with a picnic. You don't always have to have a super planned day," says Nannette.